The Sacrament of Reconciliation is available every Saturday from 3:30 to 4:30 p.m. or by appointment. There is also a Reconciliation Service celebrated during the seasons of Lent and Advent. 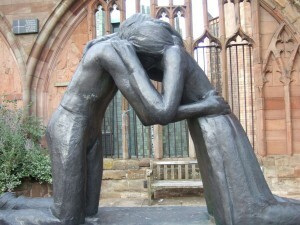 The Statue of Reconciliation at the ruins of the Old Cathedral in Coventry, UK was designed by Josephina De Vasconcellos and depicts two former enemies forgiving one another. All children who are preparing to receive their First Holy Communion, regardless of their age, must first prepare to receive the sacrament of Reconciliation (Confession). First Reconciliation is traditionally received in November or December of 2nd grade. Children preparing to receive this sacrament must have attended at least one year of prior religious education (typically 1st grade) to learn about the basics of the faith. Any incoming 2nd grader who did not attend RE classes in 1st grade will be placed in a 1st grade class to learn the basics of the faith. The following year they will be placed in a 2nd grade class to prepare for and receive Reconciliation (along with Communion). Older students (grades 3-7) with little or no prior religious education who need to prepare for First Reconciliation will be placed in a regular RE class with their age mates to learn about the basics of the faith. They will also join a group of students (RCIA/C1) that will meet several times throughout the year on Sunday mornings to learn about Reconciliation. They will receive the sacrament in the spring, sometime during Lent. The following dates apply to families with students in Grade 2 for 2018-2019. Families with older students in RCIA/C1 will receive a schedule of important dates once classes have begun for the year. A required meeting for parents of 2nd grade children who will be receiving the Sacrament of Reconciliation in November/December of 2018 is scheduled for Monday, October 1st and Tuesday, October 2nd at 7:30 PM in the Church. At least one parent must attend ONE of the two meeting dates. You choose which date you prefer. Week of November 26 – 28, 2018: Students will have a chance to tour a Reconciliation Room in the Church during their regular class time, and review what will happen at their First Reconciliation service. Parents are welcome but not required to participate. Families will be notified of the date and time for their child’s First Reconciliation celebration when they attend the Parent Meeting on October 1st or 2nd, 2018. Contact Cathy Gillooly in the Religious Education Office at 630-554-1425 or reo@stanneparish.org with questions or concerns regarding First Reconciliation.